The Figures in Sound, op. 43, were written as a commission from the Camerata academica of the Mozarteum, Salzburg and have, since their première, been performed and recorded by several orchestras. In three movements, which have only a loose connection with each other, the technical capacities of 17 solo strings are organised in varied ways to form a mobile of changing sounds. The pronounced ability of string parts to melt into each other allows much fantasy in blending sounds, which then take on different degrees of motion, of directional tendency or of density. The attractively colourful ideas in sound grow out of one another and create a form, the idea of which is fluctuation. In addition, optical concepts such as e.g. rotation of triangles and the figurations in time and space of a mobile serve as principles in shaping the work. The two framing movements resemble one another in the formal concept and provide a symmetrical setting for the scattered "daubs" which make up the scherzo-like middle movement. The finale, with the resonant pathos of a slow movement, closes the "symphonie en miniature". In the Klangfiguren, sounds and playing methods employed in contemporary music, e. g. clusters, many-voiced chordal structures, superimposed sounds, polyrhythms etc. are notated exactly. Klangfigur II, for example, illustrates the transformation of geometrical figures into a musical structure. By virtue of the fact that the technical demands made on the player have been kept deliberately at a minimum in all the parts, the main purpose of the work can be seen to be its use in orchestral training, particularly with amateur orchestras. The effect of Klangfiguren is dependent essentially on a detailed realisation of the dynamics, timbre and intonation in the individual instrumental groups. It is recommended, therefore, that intensive rehearsals be held separately for those groups which - as can be easily seen from the score - belong together, so that the ear of each player can become attuned to the musical events. If it is at all possible, the overall sound of the writtenout clusters should be homogeneous, without any individual part standing out. In bars 1 - 4 of the first piece, for example, this can be practised very well with violins 1 - 10 and violas 1 and 2. Consequently it is important that the end result of the Klangfiguren, which constitute a mosaic of many individual elements, should be an overall impression of fine, welljudget tonal balance. So that this might be achieved, it is vital that each player trains his ear carefully in the manner outlined above. The performance of Klangfiguren is entirely within the capabilities of an amateur orchestra, but professional chamber orchestras can also make use of the pieces as profitable "studies" in the acquisition of new musical devices, and as a means of enlarging their repertory.In order to make possible a quicker understanding of the musical and technical demands of the pieces, each part has been notated exactly. In the cycle in three movements, Figures in Sound, op. 43, written in 1971 as a commission for the Camerata academica of the Mozarteum, Salzburg and premièred there on the 2nd October of the same year, closely-woven blocks of sound organised in multiple layers are extracted from the string orchestra divided into 17 individual parts. Besides passages in several parts in linearly conceived polyphony, e.g. in the first movement, there arise chromatically saturated clusters with powerful effects. The expressive content of such bursts of sound is of secondary importance in relation to the dominating role of the formal and structural aspects of the whole composition. The full chromatic range is opened up at the beginning of the 1st movement, both linearly and simultaneously. Two longer sections follow, in which - with a four-note model as a starting point - different kinds of interweaving of linear and chordal processes takes place. The uniformity of the chromatic work in all dimensions results in a coherence between the relatively short, cell-like motif complexes which lend the texture an animated inner life. Geometrical figures such as the rhombus, triangle and quadrangle give the 2nd movement its contours, whereby multifarious techniques for the stringed instruments provide it with its colour. The 3rd movement takes up the motif-based technique of the 1st movement again, but now draws on a greater variety of melodic ideas from the total of possible intervallic relationships. The first section opens the intervallic fan from the minor second (presented melodically) via the major second (as simultaneous interval) up to thirds and the fourth. Tritone structures dominate the melodic ideas of the powerful second section. The closing section opens initially with a reminiscence of the beginning of the movement, developing then into a kind of synthesis in which the elements of the two previous sections grow together and fill longer melodic phrases, until clearly perceptible fourth and fifth structures lead into re-closing of the intervallic fan to a second in the coda. The first movement in particular, densely worked and in parts with dialogue-like linearity, left a strong impression. But the tattered, bizarre gestures of the Figure II and the partly neo-expressionist, partly "in higher spheres" outbursts and layers of sound of the Finale had the power to captivate. 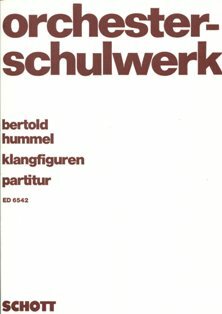 Figures in Sound 1 and 2 was the name given by Bertold Hummel to his opus 43 for 24 strings, composed in 1971as a commission for the Camerata Academica - it could just as easily be called "Musical Mobile". Movement of sounds is its striking characteristic, technical constructions in fluctuation - for once without electronics - transformed into purely instrumental music. The constant transformation of glistening whirring (figure 1) or pizzicato drops of sound (figure 2) into energetically clashing sonorous blocks, the contrast of logically inevitable development and deliberately rough sequences of unrelated sound conglomerations, of sprinklings of melody and atonally dense translations of abstract-optical shapes into acoustic forms - all of this results in the fascination of this both brief and entertaining work.